You are currently browsing the archives for the "Unit" tag. These hanging hot water unit heaters are the most efficient, heavy duty units available! They feature heavier gauge construction, using laser cut tup quality G90 Galvanized. All units feature adjustable louvers so you can adjust the direction of air flow. 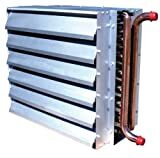 One common application for these unit heaters is for use in conjuction with outdoor wood stoves when transferring heat from the furnace to an area such as a basement or shop/garage. They can be used with any Hydronic (hot water) system. These come with two threaded wells to hang the units from. A 110V thermostat will control the units fan which will maintain the set temperature.